rainbow | Hip Hip Hooray! Have you heard? Rainbow is so hot right now – as evidenced by Joslyn’s rad party featured yesterday and the abundance of rainbow cake that has hit the Internet. Bring on the color! No seriously, slather it on. Love this party! My girls would love it too!!!! I can wait to do something similar! Love the colors! Just stunning! I heart ribbon! Gasp! 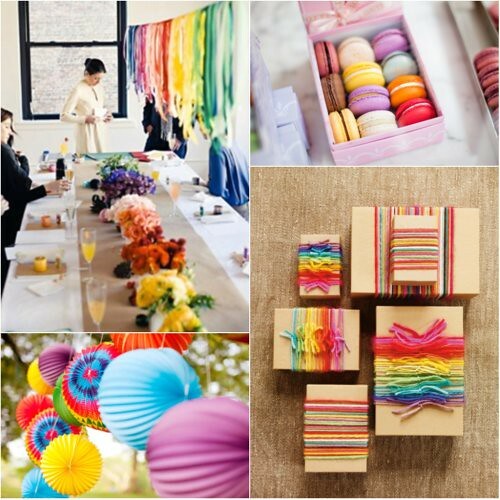 Loving the over-the-top and yet full-of-taste rainbow parties. Bring on the color, INDEED! i can’t get over the color. keep it coming! Love this. Posting to our FB page today. thank you! : ) we love color!